Mayor Liam Carroll and county manager Martina Moloney pictured with the award winners. 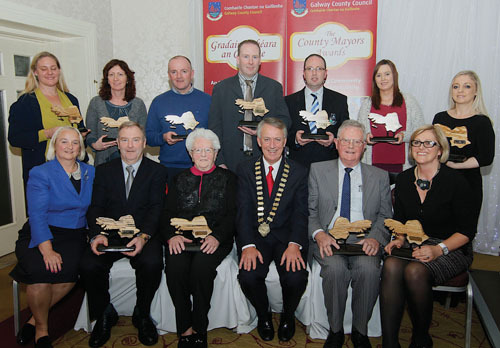 More than 250 people from community and voluntary groups from all around County Galway were honoured at the County Mayors Awards Ceremony on Tuesday in the Claregalway Hotel. The awards recognise and celebrate community and voluntary activity around County Galway. Eleven Awards were up for grabs after a public call for nominations was made back in October. The winner of the prestigious Volunteer of the Year Award was Frank Glynn from Milltown. Mr Glynnis a founder member of Milltown Development Association. He organised and ran the famous Milltown Carnival and races for 24 years. He is a key person in the Tidy Towns Committee who have won several awards and has worked closely with the County Council over the years to improve his village and gives on average 25 – 30 voluntary hours per week to his community. The first award of the night, the Business Contribution to Community Award, was won by Kavanagh's Super Valu in Clifden. The Award recognises the contribution that the private sector makes to communities. As well as sponsoring events, staff organise fundraising events for Cancer Care West. They have bag packing days for local groups and are involved in Clifden Tidy Towns. The second award, the Community Economic Initiative award was won by Ahascragh Development Association. The award recognises community groups who have developed initiatives in their area which have made a positive economic impact on the community. Ahascragh organised their first St Patrick’s Day Parade in 2013 and successfully applied for an ID community project through the Galway Film Centre. They held their village festival to coincide with the Gathering and are involved in fundraising for the Galway Hospice. The next award, the Environment award was won by Abbey Community Development Association. Abbey was awarded Galways Tidiest Town in 2013 with a mark of 304, the highest ever received by a Galway entrant. The Galway All Ireland 2013 Camogie winner Therese Maher received a great reception as she took to the stage to introduce the sports award. The award was won by Maree / Oranmore Football Club for their efforts to increase the number of young people taking part in sport. Formed in 2005 it has expanded since to cater for 550 young people with over 70 voluntary coaches. In 2013 they won the Under 12 Connacht Cup, the Under 14 Galway Cup and League and the Under 10 Galway Cup and Shield. The next award of the night was the Arts and Culture award. This category was hotly contested with Blue Teapot Theatre Company coming out on top. Blue Teapot is a theatre group where actors with an intellectual disability can be creative. In 2013 they won the Dublin Airport Authority award from Alliance Business to the Arts. They also received an Irish Times Theatre award nomination and two nominations from the Dublin Fringe festival. Killimor and District Development Society won the Heritage Publication award, for their publication Killimor: Our Parish and Our People. This book researches and records the history of the parish and people of Killimor with illustrations, photographs and an accompanying CD. The Schools Contribution to Heritage award was won by Scoil Bhriocáin in Ros Muc and recognises the efforts that schools have made to celebrate and promote the heritage of their area. The school is involved in many heritage projects such as researching the history of Ros Muc and a Comenius Saints and Heroes Initiative with schools from Slovekia, Sweeden , Germany, Bulgaria and the Netherlands. They also studied the poet Raferty and completed a project looking at the Titanic's relationship with the west of Ireland. Ionad Oidhreachta Leitir Mealláin agus Ghrumna I gcomhpháirt le Muintearas were the winners of the Best Contribution to Heritage award. The Heritage Centre has been in existence since 2009. They recently carried out the project Rebuilding the Galley Garumna which won an international Classic Boat award. The Age Friendly award ecognises groups who work towards supporting older people andTearmann Eanna Teo were the winners. They build houses for older people, provide a day care centre and residential centre for people with psychiatric difficulties. They provide a meals on wheels service and organise several events throughout the year. Tuam Youth Bank were the winners of the Social Inclusion award. They are a group of young volunteers who meet weekly to give grants to other marginalised young people in the Tuam area and surrounds. To date they have given €21,000 to 43 groups of marginalised young people. Speaking about his experience since taking up the office of County Mayor, Cllr Liam Carroll said that “since becoming Mayor of the County I’ve had the pleasure of visiting and working with more communities around the County and witnessing all the great work that you do.”. After the ceremony Mayor Carroll congratulated all the winning people, groups and organisations adding “I know it’s a cliché but you are all winners tonight and I urge you all to keep up the good work”. Would ya have a tenor on ya? Page generated in 0.2127 seconds.